Year 12 student Amelia Filmer attended the National Youth Science Forum in Canberra during the school holidays The forum is a 12-day residential program designed to give students a broader understanding of the diverse study and career options available in science, technology, engineering and mathematics (STEM) and to encourage continued studies in these fields. Here is an excerpt from Amelia’s experience. “In the summer holidays I had the opportunity to attend the National Youth Science Forum (NYSF) in Canberra, which is a 12-day residential program for youth run by youth at the Australian National University (ANU). Getting on a plane to Canberra I had no idea what to expect and I certainly wouldn’t have believed you if you had told me that the experience I was about to embark on would be life changing. 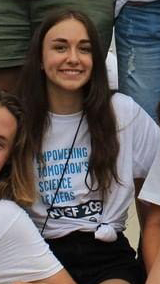 I applied for the NYSF with the hope of maybe discovering a career or a field of science I wanted to pursue after Year 12, but as it turned out NYSF was so much more than that. The first day at Burgman College at ANU I met like-minded people from all over Australia who I would get to share the experiences of NYSF with and who really made the session as great as it was. The session was full of incredible experiences including meeting Australia’s Chief Scientist, Dr. Alan Finkel, video chatting with CERN (the European organisation for nuclear research), visiting applied ecology laboratories, and participating in hands-on demonstrations at a huge range of places from radio telescopes, to arboretums to hospitals. We had specialist lectures from leading industry professionals on critical thinking, the psychology of persuasion, the influence of art in STEM, or the science behind antimatter and tsunamis just to name a few. It was inspiring to meet and get advice from leading scientists who have done so many amazing things with their lives to help change the world and contribute to the world we know today. And of course there were events just for fun that helped the 200 strangers become lifelong friends including a science relay, a tour of parliament house, a disco, swing dancing, swimming, sports evenings, and concerts. It’s hard to summarise the best two weeks of my life but I do think some of what made the program so incredible was the infectious enthusiasm of all the people involved which filled the program with fun, the inspiring STEM experiences which broadened my view of the world, 200 incredible students some of which will be lifelong friends, and the opportunity I had to learn more about the world beyond high school and the exciting things that lay ahead for all of us.